I had trouble writing this blogoversary post because what is there to say? I think I’ll try to list what blogging for three years have done to me. I pay attention to the books that will be coming out. In the past, I didn’t keep track or paid attention to those type of book news because I didn’t feel the need, but now, paying attention to them is engrained in my soul. I gotta know what awesome books will be published! I am comfortable going to book events alone. Most of my friends live across the ocean/country/states, or don’t read YA, so they’re unable to come with me. It was scary at first to go alone, but I’ve done it so much that it’s no big deal to me now. I know what books are for me, and what books aren’t. (That doesn’t stop me from reading the books I know I won’t like because I’m still a big believer of giving a book a fighting chance even though I will hate myself for it. Still learning to trust my instincts.) In the past, I didn’t have an idea of the kinds of books I like. I just picked whatever sounded interesting, but now, I have tropes I know I love reading about or dislike reading. I have conquered Photoshop. Well, not really, but I did finally understand how to use it efficiently! I was so excited because Photoshop had always been a pain for me to use in the past, but not anymore! (Well, still a little pain.) I’m not a pro or anything; I’m just happy I can work in it. Even though I may not like a book that someone else did, I can understand the pros of it. I can read books with “unlikeable characters” because those people do exist, and those unlikeable character may be likable to someone else. That’s all I can think of. I’m sure I’m missing some other ones, but that’s okay. I have to give a big shout-out to my blogoversary twins—Kristen at My Friends Are Fiction and Jessica at Literary, Etc! Today is our third blogoversary! Three years for three bloggers. Crazy, right? It totally blew my mind! We’re a triple threat! ;) You should give these wonderful ladies a visit! And of course I have not forgotten to thank you all for supporting The Novel Hermit. I wouldn’t be here without you guys. I feel so blessed to be in this wonderful community. You guys make me more excited about books, and you really inspire me. Thank you! Let’s celebrate in style! Party, confetti, dancing, and awesome giveaways! In honor of my third blogoversary, I want to celebrate by hosting two giveaways for US and international folks! Giveaway #1 is only opened to the US. 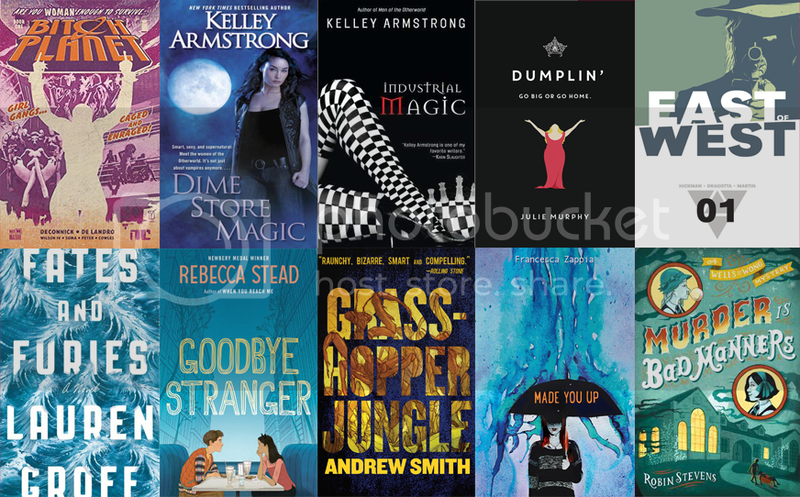 Giveaway #2 is only opened internationally (as long as The Book Depository delivers to you). The giveaway will run from December 19 to December 31, 2015. 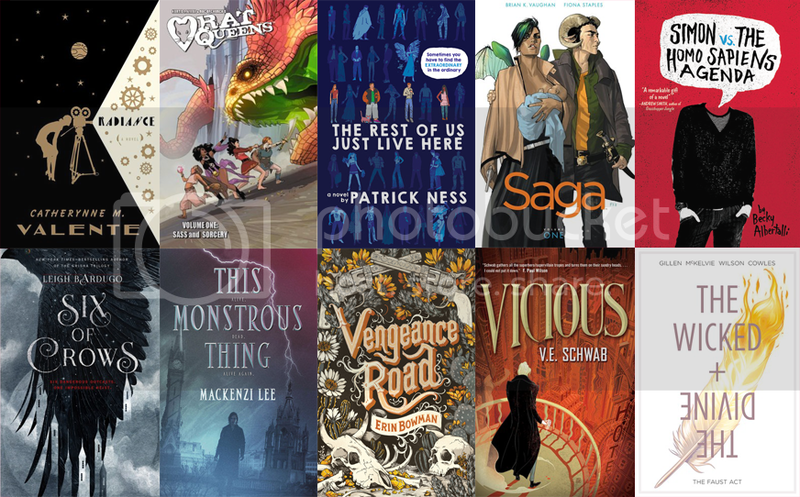 Enter to win a box of awesome books! So? What are you waiting for? If you’re a blogger, how long have you been blogging? What have you learned? How was your 2015? I adored A Thousand Pieces of you this year. I’m a fan of time travel (yes DOCTOR!) and examining the idea of fate. So the dreamy romance, and action, drew me right in and made this my favorite book in a loooong time! Congratulations on your third year! You can go to Hogsmeade this year ;). Just wanted to say that your blog is beautiful and the content and person behind it is amazing as well. A book I always recommend is Me Before You by Jojo Moyes. It made me stay up past midnight, read it on car rides, and bawl my eyes out and question why I read books if they hurt me this much. It’s obviously perfect. Happy blogloversary! I loved The Hurricane by RJ Prescott and An Ember In the Ashes by Sabaa Tahir. Thanks for the giveaway! Just dropping by to say HAPPY ANNIVERSARY!! Happy blogoversary! Three years is amazing! My favorite read of this year, which you should totally check out is the Shatter Me series because the writing is so unique and fantastic! I loved this series so much that I read it three times! btw. I’m the one whos from the UK but asked that, if I won, you could post the prizes when I’m back in the UK. Sorry for the confusion! I will recomend the graphic novel Maus by art spiegelman it is breathtaking and very sad. Congratulations Cee! Three years is phenomenal and kudos to you for making it this far! My 6 months blogoversary came and went last week but I haven’t been able to put a post up yet haha. Apparently I’m getting lazy already. Anyway here’s to more many happy years of blogging ♥️ Hope we get to know each other better over the coming year!! HAPPY BIRTHDAY TO US! I’m so excited that we started the SAME day 3 years ago. So awesome. So much love for you and your blog Cee! HAPPY THIRD BLOGIVERSAY, CEEEEE! We are only just under six months apart! I remember following you way back when you were on WordPress and thinking that you were so awesome (obviously I still think that because it’s true), and being intimidated by it! XD Oh, how things have changed, haha. I’m not really sure what I’d recommend because you have so many great books on your best of the year list already. If I had to pick one though, I’d probably say Everything, Everything, just because I loved it so much. But I’m sure you’ve already read it! The Diviners by Libba Bray great characters, love, mystery, and flappers! Happy 3rd! I have been blogging since 2009, but blogging books since 2014. 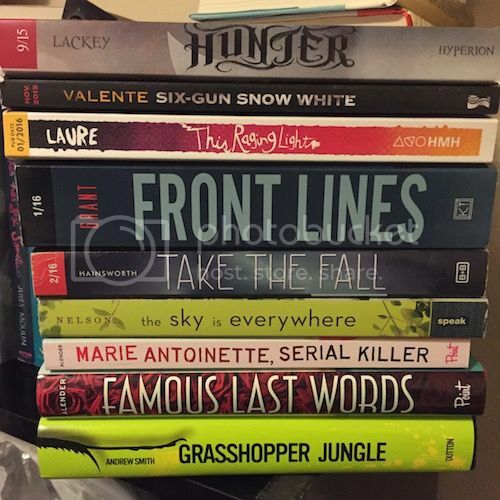 I think book blogging has a really big community and it has been my favorite sort of blogging. Happy Blog Anniversary to you! I recently read Sword and Verse, I really loved it. I would definitely recommend it to anyone who loves YA. How to be both by Ali Smith was one of my favorites this year… it’s sort of experimental fiction and you get to follow both a teenager in the present and a painter of the 1460s. It’s really interesting and depending on the copy you get a different chapter is the first one and it changes your understanding of the book. I recommend Prisoner of Night and Fog by Anne Blankman. I wasn’t a historical fiction person before this book, but Anne Blankman changed that. The writing is so deliciously descriptive and historically accurate that I was able to picture myself standing in the middle of pre-WWII Munich. The main character is delightfully dynamic, and the love interest is a handsome, brave reporter eager to expose Hitler for who he is. The Carnival at Bray by Jessie Ann Foley. It’s a YA novel (that is I think described as historical non-fiction even though it only takes place during the 1990s [which makes me feel really old, since that was decade of my childhood]). But, the writing was beautiful and atmospheric, and more importantly, it takes place in Ireland, and for some reason I’m a total sucker for books that take place in Ireland. My favorite read this year was Violent Ends by Shaun David Hutchinson. It’s told by 17 points of view. That may sound cray cray but it works for this particular story. I believe it’s a MUST-read book. My favorite book this year is I’ll Meet You There by Heather Demetrios. Great characters, diversity, love and all the feels!! This description doesn’t do it justice but believe me it’s amazing! Happy blogoversary! :) I read so many books this year, that I have a hard time remembering them off the top of my head. I would have recommended Vengeance Road, but I see you already read it. :) Some other books I read this year that made an impression on me are I’ll Meet You There by Heather Demetrios and Rites of Passage by Joy N. Hensley. Congrats on making three years! That’s so amazing! This year has been the year that my love for Outlander has really manifested so I highly recommend the books! A Court of Thorns and Roses was big surprise for me and made me jump on the Sarah J. Maas train. A Game of Thrones is also a new favorite and something I’m so glad I challenged myself to read. It’s a huge book, but it’s worth reading because Martin has such a great way of storytelling. *hugs* Happy, happy blogoversary, Cee! That’s amazing, and I love chatting with you about comics. Not that I do it a lot, but I know I can definitely rely on you for that! Happy three year anniversary! One of my favorite books that I read this year is We Were Liars by E. Lockhart because it was just a fun, twisty story. Once again, congratulations and thanks for the giveaway! My recommendation is A Thousand Splendid Suns. It made me cry, which hasn’t happened in a long time! Congratulations, Cee! This is my third year as blogger too and I know how amazing it feels to have made it this far. Here’s to all the epic content you’ll be undoubtedly creating in 2016! From my favorite books of this year I recommend you Love Rosie by Cecelia Ahern because i freaking love it and make me feel everything. And another favorite is Steelheart by Brandon Sanderson. That book was just epic and blew my mind. If you’re looking for a new fantasy series go for Brandon Sanderson’s Mistborn series. It’s got awesome world building, vast magic system, great character development and of course a badass female protagonist. Congratulations on your third blogoversary! One of my favorite books this year was a quirky little British novel, A Robot in the Garden, it’s about this thirtysomething guy in the future who ends up befriending this adorable little robot who pulls the guy out of his funk. It’s odd, but in a cute, often funny, and sometimes touching way.